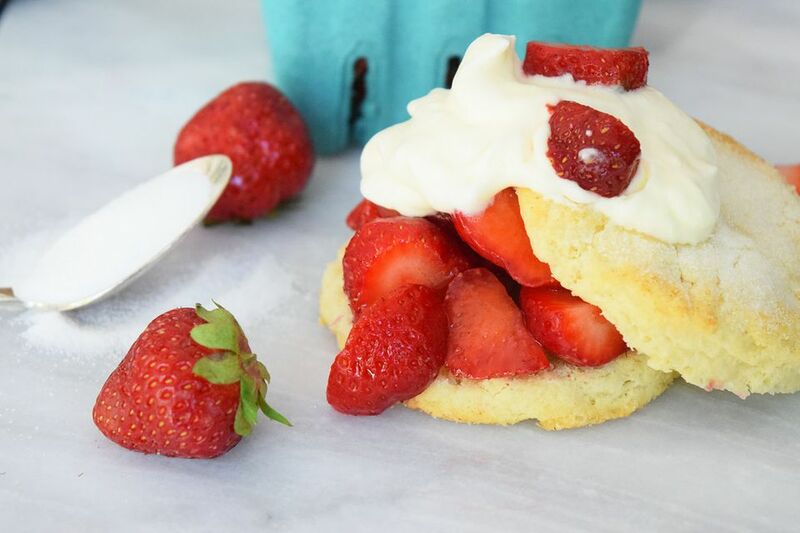 Who says you can't have Strawberry Shortcake for breakfast? In the summertime we eat this stuff morning, noon, and night. It makes a delicious breakfast, or lunch, or dinner, and ok, dessert too! It's also pretty easy to whip up, even though every part is completely homemade. It's simple, which is probably what makes it so special and delicious! You can also make it well ahead of time, so you can focus on other parts of your brunch, lunch, or dinner! I use a simple biscuit recipe with a little extra added sugar. The biscuits are hot and fluffy and just slightly sweet. I like to sprinkle a little extra sugar on top of the shortcakes too, but this is of course optional. The whipped cream is always best when it is homemade, and the strawberries are best when freshly picked. So obviously, it's best to serve this stuff in the summer when the strawberries are in season! Since strawberry season is almost over here in Connecticut, we are fitting as many strawberries into our diet as possible! Strawberry Rhubarb Muffins, Strawberry Rhubarb Pie, Strawberry Rhubarb Sangria...strawberries for days! Take the butter out of the refrigerator or freezer, the colder it is the better this recipe will work! Cut it into small chunks. Combine all dry ingredients and butter in food processor, pulse until it forms fine crumbs. You can also use a handheld pastry blender and a large bowl. Slowly add in buttermilk, pulsing as you combine ingredients. Turn out dough onto a clean flour surface.Roll out into a thick sheet, about 1/2-1 inch thick. Cut using a biscuit cutter and place onto an un-greased baking sheet. Sprinkle each shortcake with sugar. Combine the sliced strawberries with the sugar. Allow to macerate in a bowl. Whip the cream with a hand mixer, of using the whip attachment of a stand mixer. Whip until the fluffy and somewhat stiff, be careful not to over whip or it will turn into butter! Fold in the powdered sugar and the vanilla. Split the shortcakes in half, top with sliced strawberries and whipped cream, top with the other half of the shortcake and serve!